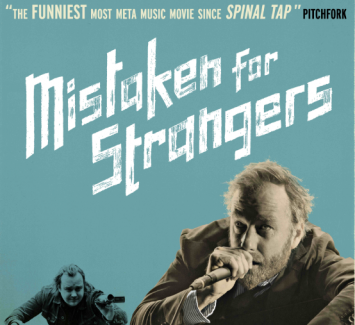 It took me a while to realize the significance of the title for the movie, Mistaken For Strangers, which follows The National on its breakout tour in 2010. This is really a love story of family bonds and a band of brothers, as told through the life of Tom and Matt Berninger. Although nine years apart and physical opposites, they still share the same wispy blond hair, beady ice blue eyes and sinewy noses worthy of a caricature. And as those who have experienced parenthood learn firsthand, the film explores the notion of individuality as it begins at birth. 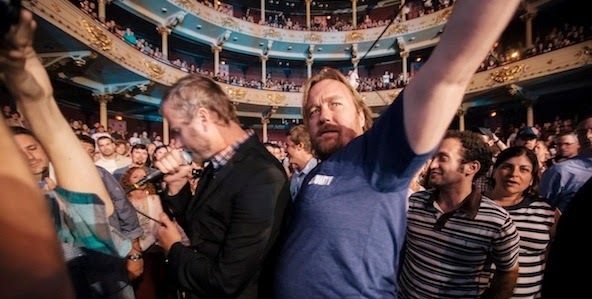 The music of The National has always struck a deep, emotional chord in me -- much to do with Matt Berninger's signature, mellow-to-the-core vocals. This compilation of raw footage does not shy away from his dark moods, as well as the entire band's commitment to the music. I was at the Brooklyn Academy of Music tour stop and remember feeling thrilled that they were blowing up as a group, yet worried about their personal psyches at the same time. This movie captures that fragile moment in time, when those rock star dreams really did start coming true after the critically acclaimed album, High Violet. The National certainly looked comfortable on the huge festival stage when I caught them last fall at the ACL Music Festival in Austin and their latest album, Trouble Will Find Me, was an easy pick as one of my Top Ten Releases of 2013. While the movie is now available on iTunes, it'd be better on a big screen with those "you are there" footage of concerts and larger than life close ups revealing the weight of making it, whether as a band or a family. Head over to the IFC Center in New York City or for those in CT suburbs, The Fairfield Theatre Company will have a showing Monday, April 28. The brothers Berninger also visited the KCRW studios in March - listen to their engaging interview in the archives here.